user-generated Headlines and reports on this page = 5 news items. Page - 8. 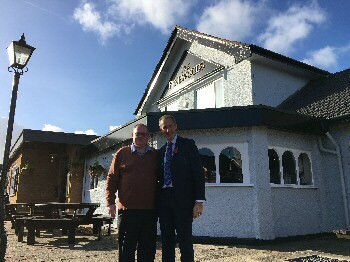 BILL Esterson MP has visited the Pinewoods in Formby, a pub recently acquired and then invested with a ￡230,000 refurbishment. 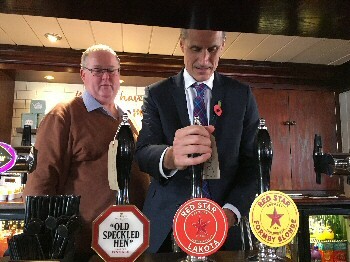 The pub opened, on 16 October 2017, by landlord David McCartan, who promised to make the pub the cornerstone of the community. Cask ales from local breweries, a high value menu offering Sunday Roast to Premium Burgers; local bands and events that bring people together such as live sports and bingo afternoons, have already been brought in. New owner Stonegate Pub Company kept on the previous staff team of 16 and recruited a further 9 to extend the team. In addition David appealed for local sports teams to step forward for sponsorship by the pub. Formby Seahorses U9's did just that, and have already been fully kitted out Courtesy of the pub. Mr Esterson commended the pub on their efforts and contribution to the community. David said:- "It's been a fantastic 1st few weeks. We've really hit the ground running and Christmas looks like its going to be fantastic with the Pinewoods fast becoming every ones local." The LECCY; the Council's not for profit energy company; will be on hand to offer advice on switching which could potentially save households hundreds of pounds a year. There will be free tea / coffee available on arrival and a free bag of veg to take home (while stocks last). Those attending will be entered into a free prize draw to win £100 off their gas/electricity bill, a microwave and a Christmas Hamper Courtesy of Morrison's in Speke. There will be free health checks, manicures, flower arranging taster sessions and chair based exercise in the form of Active Bingo, with prizes on offer. The event will be opened by the Lord Mayor of Liverpool, Councillor Malcolm Kennedy, who said:- "We have a duty to make sure the most vulnerable are given the best chanced of coping in the upcoming cold weather. It is important that as many people as possible attend this event so they can get advice and support on staying warm and healthy so that we can keep the number of excess deaths as low as possible." Councillor Gerard Woodhouse, Mayoral Lead for Older People, said:- "What we are trying to do with this event is prevent avoidable deaths. All the organisations taking part want to get messages out about how our older people can stay warm, safe and active during the winter months. There will be a lot of information, advice and support available and I hope as many people as possible come along to the event and they will be able to cope much better with the cold weather." More information about the Healthy Homes programme can be found online or by calling freephone:- 0800 012 1754. ORMSKIRK Hospital will be offering support for the 3rd year running to families remembering lost loved ones in the weeks before Christmas. The 'Baby and Child Remembrance Service' will be held at Ormskirk Hospital and led by the Trust chaplain, the Rev Martin Abrams. Martin said:- "The run up to Christmas can be a very exciting and special time but it can also heighten a sense of loss, grief and isolation. This was a much appreciated and successful event last year with more than 60 people attending; many of whom told us how helpful they found it. We hope the short, informal service will be supportive to anyone who has suffered a child or baby lost; not just recently, but at any time in the past. The Salvation Army band will join us and we will be writing the names of loved ones on baubles to hang from our Christmas tree. This year, our visitors will also have an opportunity to take a bauble home with their loved ones name on, so they can hang it on their own Christmas tree too." The event will start with refreshments in the main Ormskirk Hospital's entrance, at 6pm, on Wednesday, 6 December 2017, before moving to 1 of the Hospital's gardens for the service. Tarleton's Sooty's Plants in Southport New Road is providing an 8ft plus Christmas tree to mark the special occasion. In 2016, approximately 200 names were registered across the 2 Hospital sites. Trees of Remembrance will also be available in the prayer and quiet rooms, at both Southport and Ormskirk Hospitals, during December. Visitors will be welcome to write the name or names of loved ones on a decoration and hang it from the tree. LEARNER drink and drug driving information courses should be incorporated into driving test requirements, according to a leading motoring lawyer. Frank Rogers, head of Just Motor Law, the motoring division of Kirwans law firm, which has offices, in Hoghton Street, Southport, as well as in Liverpool and Wirral, is calling for an awareness raising element to be introduced into learner courses to ensure that drivers are completely clear of the law around driving, drink and drugs. Speaking at the National Road Safety Conference, Frank spoke of his concerns that despite the introduction of new drug driving legislation in 2015, many drivers still appeared to be passing their test with little or no knowledge of the effect that alcohol and drugs; including prescription drugs; could have on their ability to drive. Frank said:- "Drivers who have been disqualified for at least 12 months for a drink drive offence can be referred to a drink drive rehabilitation (DDR) course, yet as it stands there is very little in place to educate new drivers about the dangers of driving while under the influence before they hit the roads. DDR courses have had a remarkable effect on changing the behaviour of those convicted of drink driving offences, and I firmly believe that by introducing learner driver versions of these courses, incorporating additional information on drug driving, new drivers will be far better prepared mentally to keep both themselves and others safe on the roads." More than 1,300 people were killed or seriously injured in drink driving incidents in 2015, and the latest figures show that alcohol is to blame for 12% of all road deaths. Road safety charity Brake also report that impairment by illegal or medical drugs was officially recorded as a contributory factor in 62 fatal road crashes and 259 crashes resulting in serious injuries in 2015, in Britain; but that experts believe that the true figure could be much higher. Frank said:- "According to the Department for Transport, offenders who attend a DDR course are 2.6 times less likely to re-offend. With that in mind, I would urge the DfT to introduce learner drivers to their own version of such a course before they even hit the roads, in the expectation that the information retained would help drivers make informed choices when it comes to drink and drugs." A special service to remember those who have died or been injured on our roads will be held in Liverpool on Sunday, 19 November 2017. Road Peace has organised the remembrance service in the concert room of St George's Hall, part of the charity's World Day of Remembrance for Road Traffic Victims. It takes place, at 2pm, within the St George's Hall, following which guests will be invited to the memorial for crash victims in neighbouring St John's Gardens where 5 doves will be released to mark the 5 people who are killed each day on our country's roads. Pauline Fielding, from Liverpool, organises the annual event for Road Peace, where she turned to for support after her son Andrew was killed in 1994 at the age of just 18, in a crash caused by a driver who did not stay at the scene and who was never traced. She is now a trustee of the charity and says the service, which will be led by the Rector of Liverpool, Crispin Pailing, is a poignant way for people to pay tribute as well as raising awareness of how dangerous driving costs lives. Pauline said:- "We invite all those who have been bereaved or injured in road crashes, together with those who support us, to join us for this event. In every death there are so many people affected and this service offers the families and friends of those who have died or been injured the opportunity to come together and remember their loved ones. It is also a chance for us to give thanks to the emergency services for their support and to highlight this unacceptable death toll and reflect on what can be done to prevent further tragedies." 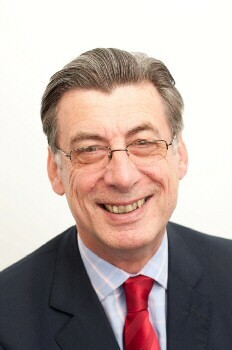 The Lord Mayor of Liverpool, Councillor Malcolm Kennedy, will attend the event. He said:- "I am honoured to be part of this service which highlights the importance of road safety by remembering those who have lost their lives or been injured as a result of a crash. It's a poignant ceremony with a strong message of support for those family and friends affected by this issue." Chief Inspector Tony Jones said:- "Merseyside Police takes road safety extremely seriously and we are committed to working with the wider community to improve the safety of our roads and reducing the numbers of people killed and injured each year. Whist we do undertake roads policing enforcement we would rather concentrate on educating all road users to make our roads a safer place and prevent the collisions happening in the 1st place. To this end we work closely with local authority colleagues from across the region to engage with and educate as many people as we can. Ultimately we want to encourage people to drive safely so that everyone can stay as safe as possible on the roads and this means basic things such as staying off your mobile phone when you are driving, wearing seat belts, adhering to speed limits and obeying traffic lights. Sunday, 19 November 2017 is the annual Road Peace ceremony, which is held in Liverpool as part of the charity's World Day of Remembrance for Road Traffic Victims, and hopefully it will make people think about the way they drive. There are no excuses for dangerous behaviour whilst driving; please think safety 1st and give some thought as to what the cost could be to your or someone else's family member if you don't." Refreshments will be served in St George's Hall following the service, which has been sponsored this year by serious injury specialists Slater and Gordon Lawyers. Carol Hopwood, a lawyer at the Liverpool branch said:- "Road Peace works tirelessly to reduce the number of deaths and serious injuries on our roads, which tragically still stands at thousands every year. The charity also provides essential support to victims and their families, whose lives have been devastated as a result of what are often completely avoidable incidents. Slater and Gordon is proud to sponsor this service of remembrance, which is so important to so many people, and to support the work of Road Peace in making our roads safer for everyone." The event in Liverpool is 1 of many taking place across the globe as part of Road Peace's World Day of Remembrance for Road Traffic Victims. It was 1st introduced in 1993 and quickly spread to other European countries before being adopted by the United Nations in 2005.